Cool Stuff Students Do: Fletcher D-Prize Winners! April 10, 2014 July 28, 2014 Jessica Daniels 196 Views Business competitions, Cool stuff! Please join me in congratulating Andrew Lala, F’14 and Tommy Galloway, F’14 as the winners of the inaugural Fletcher D-Prize: Poverty Solutions Venture Competition. 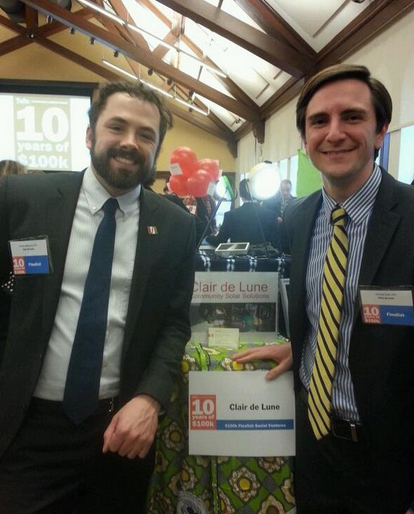 Andrew and Tommy will receive $15,000 (and tens of thousands more in non-monetary advice and networks) to help them pilot their Clair de Lune – Solar Light Distributor Platform, which uses existing bus infrastructure and cultural remittance practices to reach the rural poor in Sub-Saharan Africa. This summer, Andrew and Tommy will bring this “poverty solution venture” to 400 families in Burkina Faso. Fletcher D-Prize judges believe that, in two years, Andrew and Tommy will have an impact on the world by proving that you can provide energy to over 100,000 families living on less than a few dollars a day. We hope that this award, and the competition among a large number of very strong proposals, signals that Fletcher prepares leaders adept not only at crossing borders of all kinds – disciplinary and geographic – but also with the ability to jump across the border of knowledge into entrepreneurial action. We aspire to develop and facilitate international ninjas, if you will. Andrew and Tommy are two terrific examples of such international ninjas. A family that buys a solar lamp saves money on energy expenses and is more productive outside of daylight hours. Household incomes often increase 15-30%. Study hours for children rise by two hours. Solar lamps also erase the far too common dangers that come with kerosene lanterns. The award will be presented to Andrew and Tommy today, only two days after they received an “audience choice” award at the Tufts $100K New Ventures Competition, at which they were finalists (shown in photo above). This is the 10th anniversary for the Tufts $100K, which prompted a look back. BostInno selected Educate Lanka as one of the top six ventures to come out of the Tufts $100K competition. Congratulations to our good blog friend Manjula!